Democratic debate season has come to the media capital of the world. Bernie Sanders and Hillary Clinton have debated eight times before, but Thursday's face-off in New York will be different, partly because of where it is happening and who will be watching. Headline writers have dubbed the CNN-NY1 debate -- and the looming New York primary -- the "Battle of Brooklyn." "Whatever happens will be dissected more thoroughly and magnified more dramatically than a typical debate," Democratic strategist and New York native Howard Wolfson said. "You can screw up out of town, but the stakes are higher when the curtain rises on Broadway." After all, there are hundreds of hungry reporters covering this debate, looking for something to write about. Some of them can literally walk to work at the Brooklyn Navy Yard on Thursday evening. And all of CNN's newscasts are relocating to the Navy Yard for the day. 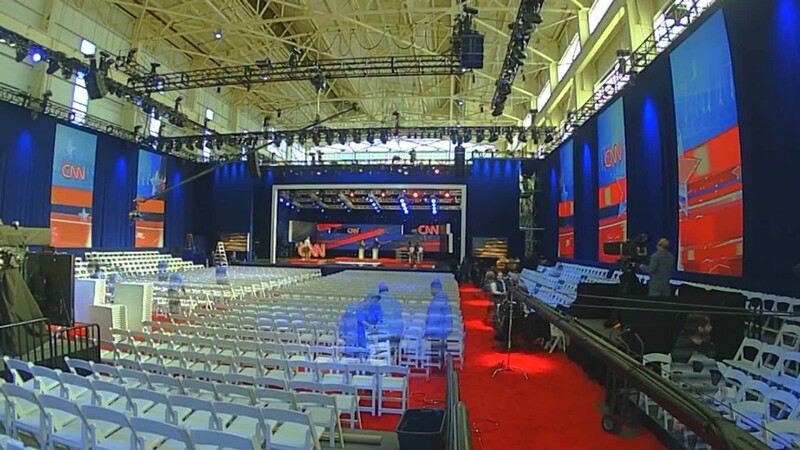 A CNN spokeswoman said close to 700 press credentials have been assigned -- far surpassing the most recent Democratic debates in Flint and Miami. And that has an amplifying affect, making the debate bigger "news," even before a word is spoken on the stage. CNN anchor Wolf Blitzer will moderate the debate at 9 p.m. ET. CNN chief political correspondent Dana Bash and NY1 political anchor Errol Louis will join in the questioning. NY1 is New York's main 24-hour local news channel. More than a month has passed since the last debate. CNN's debate in Flint averaged 5.5 million viewers. Univision's debate in Miami, simulcast by CNN, averaged about 6 million. The ratings for Thursday night will show whether interest remains steady or fatigue has set in. Louis noted that the media is a bonafide industry in New York, unlike in most other cites. "You can never be sure, but I'd be surprised if either candidate attacked the news media at this particular debate," he said. "For New Yorkers, news is a major source of jobs -- not just the reporters and editors, but also the people who staff and supply the cafeterias, mop the floors, maintain the electrical systems and provide security and transportation." He described this week's closure of Al Jazeera America, and the resulting loss of about 700 jobs, as a Manhattan version of a factory closure. The frenzy of the Manhattan media market has spilled over to the race in recent days, with accusations of bad behavior and acts of one-upmanship. Clinton stopped by a Verizon worker picket line on Wednesday hours after Sanders did the same. On Thursday's New Day, Clinton supporter Chirlane McCray, wife of New York City Mayor Bill de Blasio, said Sanders is "getting desperate, so I expect that we'll hear the volume be pumped up a little bit." Another reason why: There's a real chance this debate will be the last one of the primary cycle. The Clinton campaign would like a win in New York to widen its delegate lead and clinch the party's nomination. Wolfson, a communications director for Clinton's 2008 campaign, expressed confidence that Clinton will win the nomination even without superdelegates. But the mere existence of a debate can be construed as a win for Sanders and his supporters. After all, Sanders initially proposed a pre-New York primary debate back in January, when some doubted he would still be in the race. There was a heated back-and-forth about the exact date and place. Several networks competed to host the debate and the CNN-NY1 proposal prevailed on April 4, giving the hosts just ten days to prepare the venue. The Democratic National Committee and the two campaigns have laid the groundwork for one more debate, possibly sometime in May, but there isn't a specific date or host locked in. So for now, Thursday's "battle in Brooklyn" is the last one on the calendar.